Today I have another short blues rock lick for you. This lick I stole from Gary Moore! I think it is from Texas Blues. It's really just blues licks, but when Gary Moore plays them, he's got fat, distorted sound, so they sound very "rocking"! In the example, I am playing in the key of B, and it probably sounds best if you play over a groove that stays in the same key for the length of these two little licks. It is not a beginner lick, but it shouldn't be too hard, unless you play it super fast, like Gary Moore tends to do. Try playing it slow, over a slow blues. That first bend, you don't have to do the vibrato, if you find that difficult to do. It will still sound great, even without the vibrato on the first note. 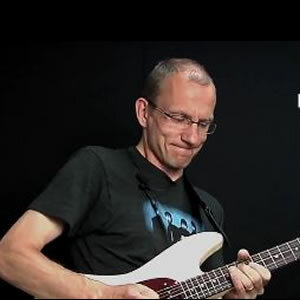 This lick works great in almost any blues or blues rock tune. Try it out!